Once Uber received his netbook for Christmas – – ahem, should I say his second netbook – – he had no need to share the iPod Touch with me anymore, so it finally became mine – – all mine!! Oh boy, it’s been like Christmas for me every day because every day I discover some cool and exciting new application that I hadn’t dreamed of before. Now granted, the majority of them are about as useful as a raincoat in the Sahara, but there are a few that are incredibly handy – – even for homeschoolers!! Amazon Kindle for iPhone – the absolute first application you need to download – – period – – is the Kindle app. 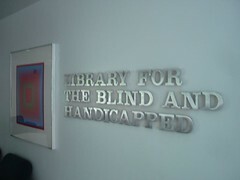 Instant access to books, magazines, periodicals, etc. is an absolute MUST for a homeschooling mom. Every homeschooling book you can think of is probably available via Kindle, but don’t shell out 300 smackeroos for a Kindle device, just add it FREE to your iPhone and voila! Evernote – The ultimate online organizer is also a terrific iPhone app! You can create text, photo, or even audio notes of everything you want to track in your homeschool – – lessons, projects, field trips, grades. You name it – you can organize it in Evernote and then sync it with any computer. Poptiq – If you are a car schooler – – even every once in a while – – you will want Poptiq. Download educational videos from anywhere on the net, and then take with you on the go. Why shouldn’t your kids be able to watch Discovery Channel on the way to gymnastics?? Classics – for your bibliophiles, be sure they have access to a fun and easy way to read the best of classic literature! Google Earth – you love it on the web and you’ll love it on the iPhone! Today in History – what an incredibly fun way to open up each school day! Take turns with your iPod touch and let each family member have a day sharing what important events happened on this day. Wikipanion – Free app that provides easy navigation, search, and use of Wikipedia. Awesome tool!! WorldCat – locate any book in any library, worldwide! Oregon Trail – there is a free and a paid version of this great program which has come to iPhone in all its glory! Brain Quest for iPhone – those cards that every homeschooler had somewhere in the back of their minivan have gone hi-tech! You can download Brain Quest apps by grade and subject. Still great for car rides or waiting in the doctor’s office. Mathomatic – solve even the most complicated math problems in step by step fashion so you can finally understand WHY you get the correct answer. Narrator – multimedia storytelling platform for the iPhone and iPod touch. Great for students with learning differences! iVocabulary – perfect foreign language tool for beginning learners. Learn vocabulary for multiple languages. If you have a favorite iPhone app for homeschooling that I haven’t listed, be sure to mention it in the comments! Are You An Accidental Homeschooler? My boss, John Edelson at Time4Learning coined the term “Accidental Homeschooler” a while back as a result of talking to thousands of subscribers to the curriculum, and finding out that so many of them didn’t start out with designs to homeschool their kids, but because of circumstances beyond their control – – either with the schools, or with special health needs, or other reasons – – homeschooling became the best option for their families. He and a homeschooling mom who considers herself an “accidental homeschooler” wrote another article recently on the subject that I hope you’ll check out if you get a chance. We were definitely accidental homeschoolers in the sense that I had never even considered homeschooling until Uber’s health scare right before he began kindergarten. (He came down with rheumatic fever of the brain and suddenly lost his ability to talk, walk, eat, etc.) I had a huge learning curve to overcome in that next year where our days were consumed by physical, occupational, and speech therapy, and I somehow had to figure out how to be flexible enough to fit some formal education in there as well. I found myself in the role of a homeschooling mom, and it was entirely unfamiliar territory for me. Flash forward to 10 years later, and I’m busy writing about things like integrating assistive and educational technology into your homeschool, interest-led learning, and homeschooling children with special learning needs. Weird. Time has a way of turning gravity upside down. What about you homeschoolers out there…did you always KNOW you would be educating your children at home or did the winds of reality knock the breath out of you and send you spinning to find an educational option you hadn’t planned on? First of all, an update: The fleas have been banished from Topsy-Techieland, and all has returned to “normal.” No, I still didn’t get to see ‘Quantum of Solace’, but we went shopping and I’m pretty sure hubby and the boys covertly got me some birthday stuff, so all is good. Reading and writing is my life. No, seriously. I live in a world of words. My entertainment, my job, and my thoughts are all based on words. So words are a VERY big deal to me. When I find out that someone is functionally illiterate it brings tears to my eyes. I just feel like they are missing out on this whole segment of life. Granted, many people throughout the ages made it through life just fine without reading a single word. But in today’s society, we are connected by the written word. The internet is still primarily a written medium. There is a lot more visual and audial content on there than there used to be, but we still spend over 95% of our time on the web getting our info from written sources. In a culture where we would rather text than talk, the written word doesn’t seem to be going out of style anytime soon. Thanks to the NLBPH and your tax dollars, my son with dyslexia can take part in life to the fullest. He can read anything and everything that he wants. He is currently devouring Eragon, a book that would normally have sat on our bookshelf unopened because it was too “difficult” for him. Not now. Now the world of words is completely free and available to him. I couldn’t be more thankful. 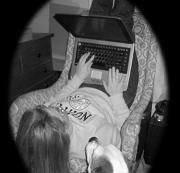 Remember – – every comment on a Topsy-Techie blog post this month earns you one entry into my November giveaway. So comment away! Ever since my boys started school I have been interested in assistive technology. Our oldest son, lovingly named on T-T as Uber-Techie, contracted rheumatic fever of the brain right before starting kindergarten, and he suddenly had trouble walking, talking, eating, etc. It was a traumatic time to say the least, and he spent the better part of the next two years in physical, occupational, and speech therapy. It was during that time that we discovered some really great assistive tools to help him accomplish certain things that he was struggling with. When Hyper-Techie came along, he brought with him a whole different set of unique challenges. He was a late talker, had sensory issues, and had an auditory processing disorder, so he was in occupational and speech therapy also, for a time. Then, when he began kindergarten, his teachers quickly tuned in to some learning differences he had. When I began homeschooling him the next year, I picked up on it as well, and eventually we discovered that H-T had dyslexia. Before long, the Techie home became central testing ground for scads and scads of different assistive technologies. We’ve tried AT for reading, AT for typing, AT for writing, and AT for math. I listed some of my all-time favorite techie tools for kids with learning disabilities in a past Friday’s Hardwired Homeschool Hints post. Many of these products not only made schoolwork easier for my boys, but truly changed their lives for the better! It is called TechMatrix, and it is a comprehensive resource on assistive technology. It allows you to search for products and resources by subject, by learning support, by product, or even by product features. OH, how I wish this had been around years ago when I was having to do hours upon hours of internet searching to find the products that would be most beneficial to my boys. Today I’m going to push the envelope, shake the sauce, change things up…you get the drift. I’m not going to hit you with a bunch of cool sites today, but rather highlight one really gnarly web application (hey San Fernando Valley and Silicon Valley aren’t that far apart; there was bound to be a crossover at some point). If you homeschool and have more than one computer in your home, you will wonder after today how you ever lived without Google Apps. 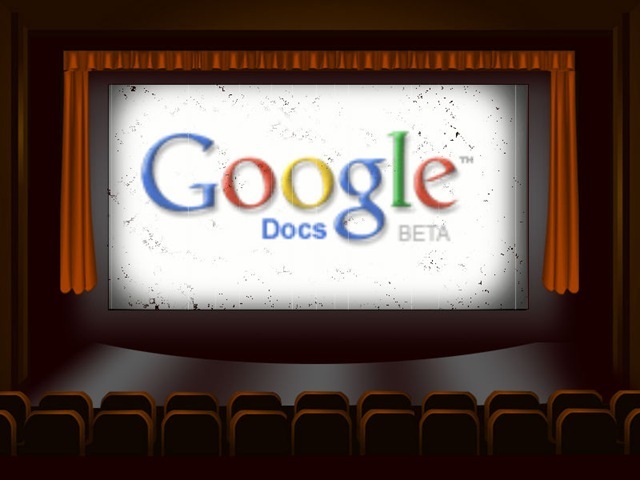 Google Apps (GA) is a homeschool mom’s dream come true. In fact, you might just throw out all those other expensive organizers when you discover that you can keep track of all your homeschool business in one easy-to-access place. See, the cool thing about GA is that you can store as much stuff as you want on there, and you don’t have to be on any specific computer to access it. Your info is stored remotely on the Google servers. In other words, you can be at the library, the coffee shop, or on your Blackberry, and “Presto!”: instant homeschool access. Rachel just finished her history assignment using Google Docs word processor and saved it in her docs file, sharing it with you. Bryan took his math quiz on Google docs and shared it with you. You, meanwhile, are sipping your coffee slowly, sitting on the back porch swing, and looking over tomorrow’s lesson plans on Google Spreadsheet app. An email comes in from your friend Lyla reminding you of the homeschool field trip next Tuesday. You copy and paste her reminder into your Google calendar, and set it to send you a polite reminder the morning of. This is just a Polaroid shot of what Google Apps can do for you, but I hope you can start to see the possibilities. One application. Any computer. Multiple uses. More to come next week…stay tuned! You see the prize for the contest is a free copy of iMindMap software (retailing at over $200). 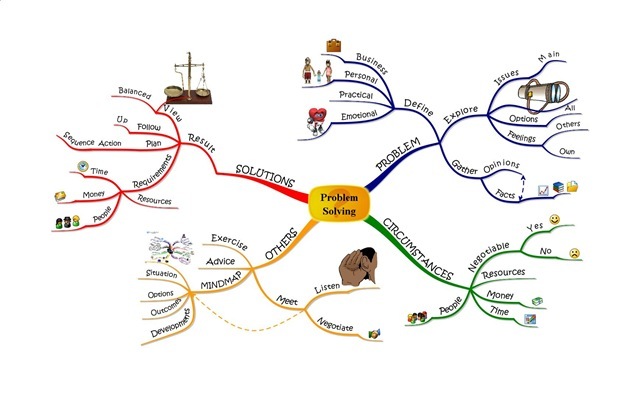 And mind-mapping is an incredibly powerful tool for some people. H-T, my right brained, visual kiddo is a master mind mapper. I’m not sure if people with dyslexia find it easier to mind-map or not, but he just “gets it”. He can come up with fifteen solutions to a problem by just mapping things out. My brain looks at his brain and just shakes its head. You know those timelines that teacher’s love so much? That’s how my brain works. Left to right. Beginning to end. Even the most creative story writing I have ever done has been by starting at the beginning, and writing chronologically right to “THE END”. I may have a general outline of where the story is going to go, but most of it gets figured out along the journey. So where do my ideas come from then? If you don’t brainstorm, or mind-map, or use graphic organizers of any sort, how do you know when you have a creative idea? Well, I’ll tell you. When my actual thinking brain is on, I only think sequentially. But when I am in “off” mode (loading the dishwasher, taking a shower, running errands) the most wonderful random thoughts just pop in my head. Sometimes they stick, sometimes they go down the drain with the dishwater. But when they stick, I jot them down somewhere, and thus begins a blog idea, a story idea, a solution to a problem at work. Recently, I was snapping green beans and got the greatest idea for a new homeschooling article! Now, granted, I can’t really take credit for something that randomly pops in my head. People who mind-map and brainstorm actually work for a living. I just catch whatever random radio-wave happens to come along on my frequency. So it’s cheating. Possibly even plagiarizing if the radio wave came from some guy down the street who was busy mind-mapping and carelessly left his window open. I can live with that. We left-brained people gotta take our inspiration where we can get it. In all my years as a homeschooling mom, I have never once woken up with the thought “Oh boy, I can’t wait until we get to do our spelling lesson today!” Go figure. Even though I was a pretty good speller in school myself, I still never got overly excited about spelling in general. Ok, there was this one time in third grade that I won a regional spelling bee and got to meet our local news broadcasters, but that was honestly the highlight of my spelling career. After elementary school, I never really thought about spelling. Spelling City – revolutionary free spelling site that lets you put in your own spelling list, and students can hear the words in a real human voice, and play games with them. You can even use it as your weekly spelling test with the testing feature. One other incredibly cool perk is the ability to create handwriting worksheets out of the spelling words!! As-U-Type – if your homeschooler does most of his or her writing on the computer, this is a wonderful program to install because it not only spell checks as they type, but keeps track of their misspelled words in a file, so you can collect them for further spelling study, or spelling lists. Skillswise Spelling – this site focuses on the “why’s” behind our spelling rules, and examines words from every angle. The site includes sections on root words, prefixes and suffixes, homophones, letter patterns, silent letters and more. Interactive games help students practice each of the concepts taught, and most of the lessons include printable factsheets for further reference and instruction. LookWayUp – similar to the Franklin spelling corrector, but in an easy to access web version. No matter what the word, or how strangely it is entered, the LookWayup program will decipher the word and give you the correct spelling and definition. Only know how the word sounds phonetically? No problem. Just type in the sounds you hear, and the program will tell you its top choice based on your input, and then list other possible choices underneath. 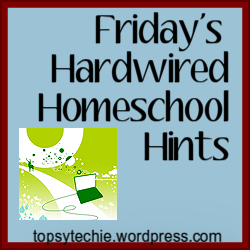 To check out the other Friday’s Hardwired Homeschool Hints posts, go to my new HHH page!